This set is very, very, hard to find so we will call it RARE. 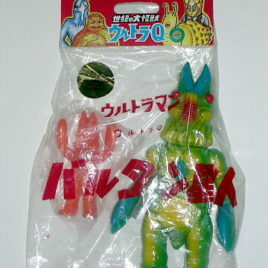 It is the GODZILLA DAISHINGEKI (Big Battle) Charafullworld (Japinglish for Colorful World) Boxed Set by Bandai 1993! 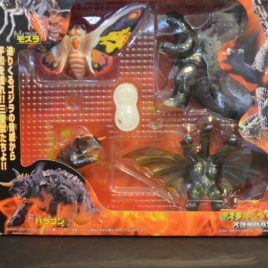 This is truly an UNUSUAL set filled with beautifully detailed figures of King Ghidorah, Mecha King Ghidorah, Godzilla, Mecha Godzilla, Mothra, Battora, Battra Larva, Mothra Larva and Gigan. It is INDEED a colorful world; the colors are vivid and unlike any we have seen in other box sets by Bandai. Each brightly painted figure stands approximately 3 inches. THIS IS AN INSTANT COLLECTION! Vintage piece: Figures are in MINT condition; however the box is Near Mint to Excellent. This is a very nice collector’s piece. CLAWMARK TOYS WARING: NOT SUITABLE FOR VERY YOUNG CHILDREN DUE TO VERY SMALL PARTS.